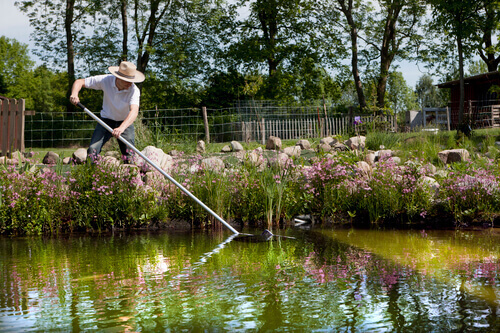 Pond Cleaning Isn’t As Easy As You Think! Home > Blog > Ponds 101 > Pond Cleaning Isn’t As Easy As You Think! Many pond owners, particularly those who are new to the hobby, underestimate the importance of pond cleaning. Ponds are complex ecosystems which are subject to the laws of entropy and if they are not regularly and thoroughly maintained they will rapidly decline, defeating the purpose of why you installed it. The procedures involved with cleaning a pond can be broken down into seasons, with spring, summer, fall and winter requiring specific and distinct approaches. Spring is when the water in your pond will become warmer, and you will need to de-winterize it. The pump can be turned on and you can resume feeding your fish once the water temperature has reached a steady fifty degrees. It is best to feed them cold weather meals until the temperature of the water reaches sixty degrees, after which you can switch them to a full season diet. Leaves and other debris should be removed from the water, either by a skimmer net or pond vacuum. During summer you will want to feed your fish well while not over feeding them. The filters should also be cleaned and aeration should be maximized. Water will be warmest in summer which means it will contain less oxygen, but the fish will use more of it. This is why aeration should be running 24 hours per day, or it can be supplemented by an air pump. Summer requires the least amount of work when compared to the other seasons. Fall is always the busiest time of the year for pond owners, especially those who live in northern climates where temperatures will drop. Leaves will also fall from trees and be carried by wind and if it lands in your pond and begins to decay it can disrupt the ecological balance. Wise pond owners cover their ponds with nets, and pond vacuums can be used to reduce the amount of sludge or debris which is present in the water. Fish should be fed less frequently since their metabolism will slow. When you do feed your fish the meals should be rich in protein so they build up a fat reserve to last during winter. Once the water temperature falls to sixty degrees you should only feed the fish once a day, and at fifty degrees or less you should stop feeding them until spring. By winter most of the heavy work should be done. The pond water will freeze over and organic materials will decompose and release toxic gases. It is very important for this gas to be released but you should never break the ice. Breaking the ice will create shockwaves that can kill or injure your fish. Instead, you will want to use a pond de-icer which floats above the water and has a thermostat inside it which turns on the heat whenever the water temperature is less than forty degrees. These devices will prevent the pond from freezing over which allows toxic gases to be released.